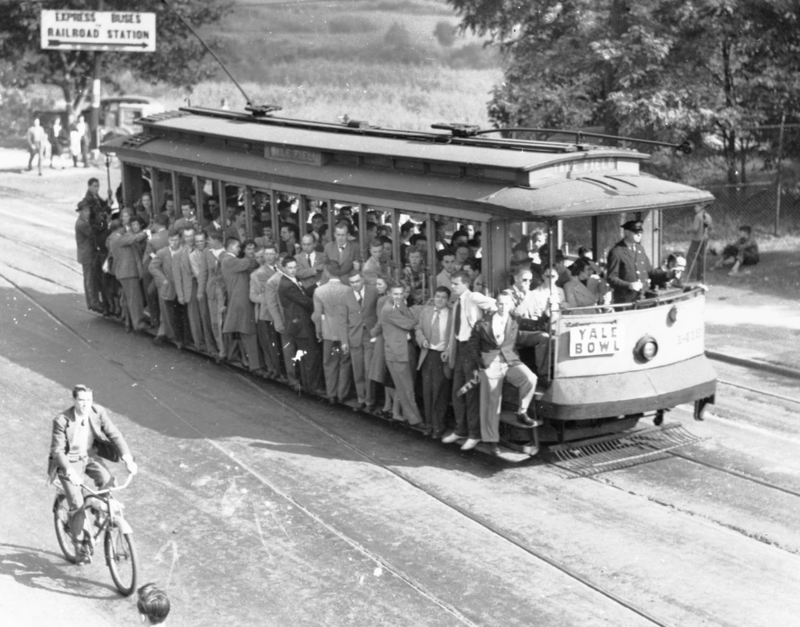 This forum lacks posts about trolley and interurban cars, so join me in posting some of your favorite photos into this post. 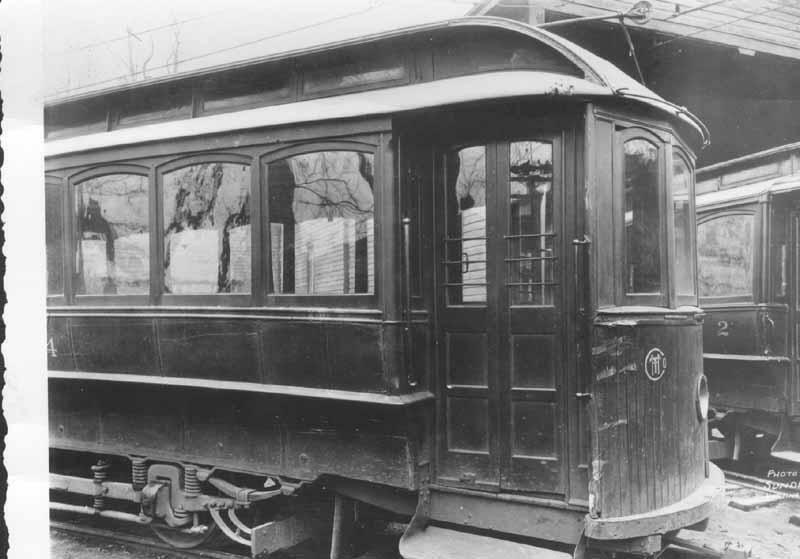 Queensborough Bridge Car In Queens Plaza. It is a shame how a museum let this car deteriorate beyond reasonable salvage. Well, I'll jump in on this one. 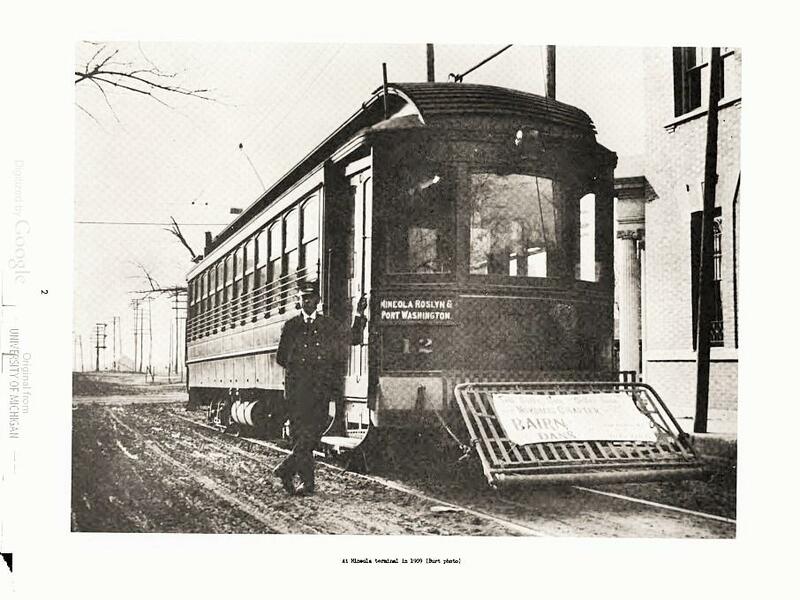 My favorite trolley photo is of an Albany, N.Y. 4-wheel, double end, 4 door car. I really don't know why this car appeals as much as it does to me. It's just a well built vehicle, well designed to do a specific job. I have a model under construction, and I'll post a picture of the model when it's finished. (Don't hold your breath...I don't work fast). 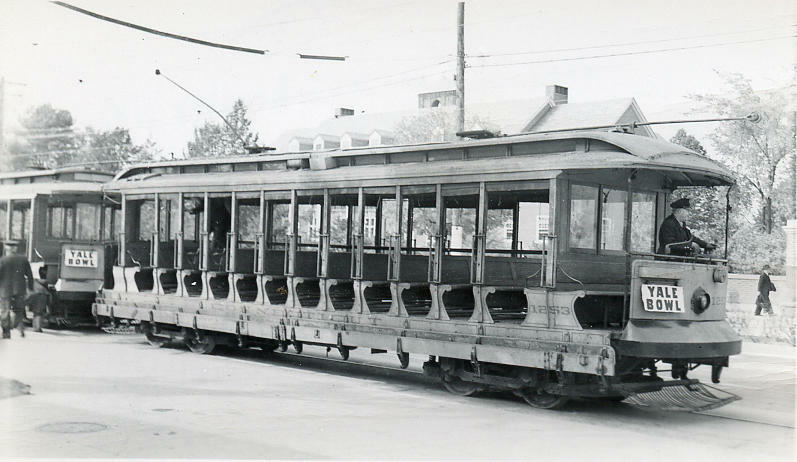 Where in Albany did the trolley system run? 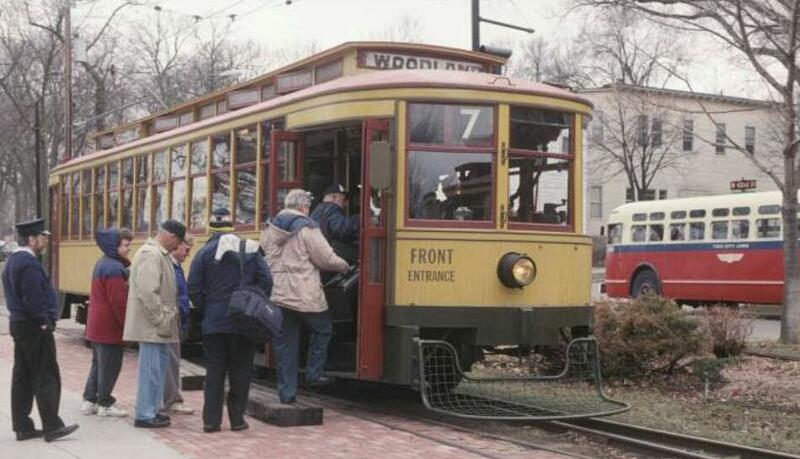 Are there any vestiges of that trolley system left? I occasionally travel through Albany, so I am curious. The Johnstown car is by Western Hobbycraft. 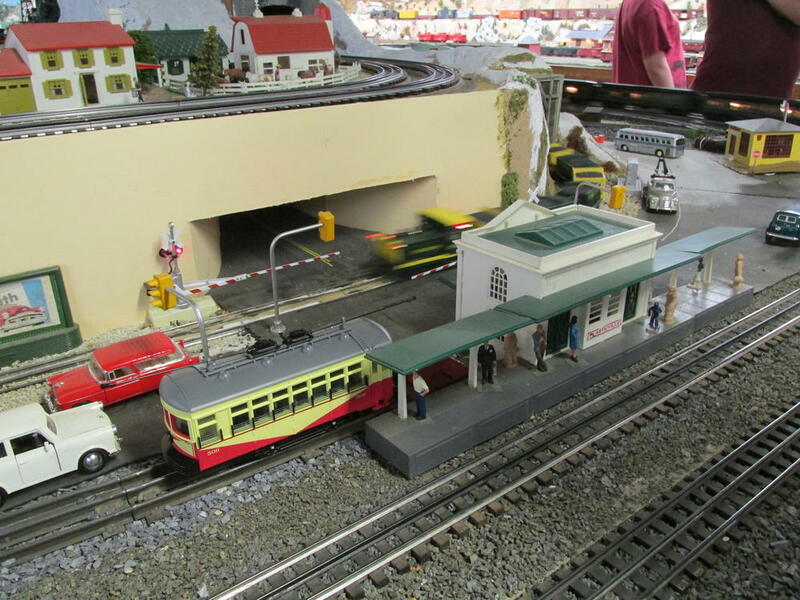 The Lehigh Valley and Third Avenue cars are by MTH. 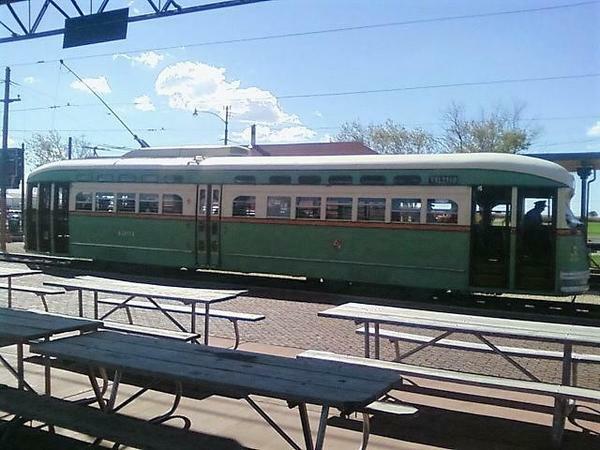 Lets see your trolley photos! 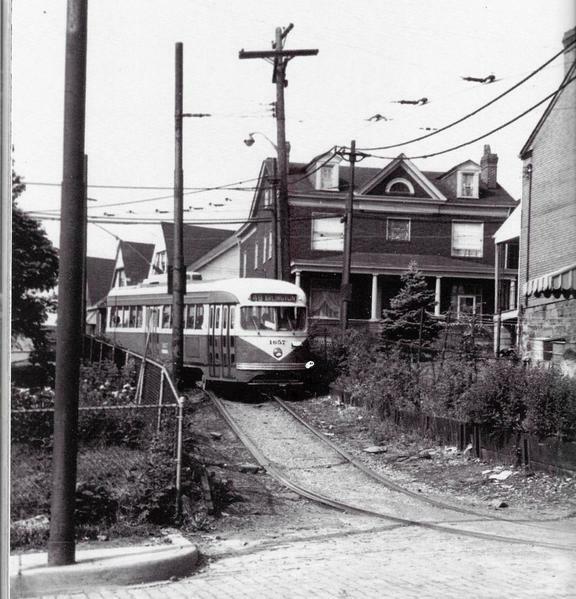 Somewhere in Brooklyn there is a trolley graveyard pit with many Third Avenue and BRT cars buried in it. Does anyone where the grave is, and something about its history? BOBBY OGAUGE, I stumbled onto this site years ago. Thanks for the link. I enjoyed visiting that site. 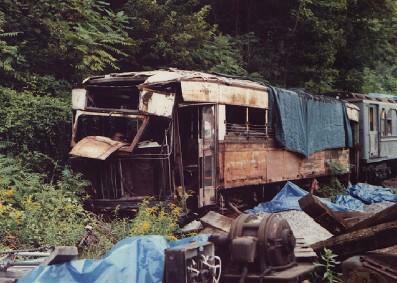 The "pit" is there but the cars were stripped and burned. Large metal parts were removed during the ww2 scrap drive. There is nothing to see. 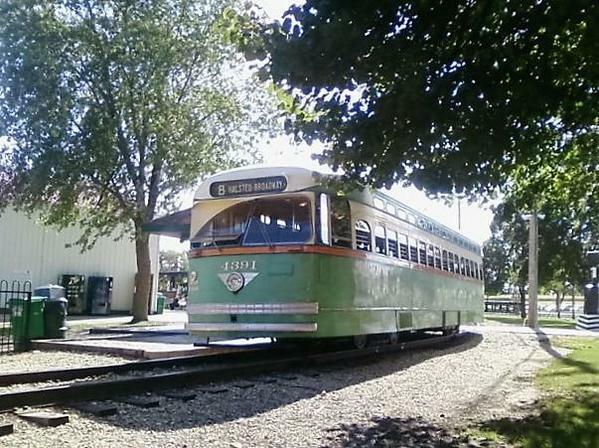 I remember riding the Peter Witts on route 68. I can still remember the sounds of the air compressors. Here is one from my Brooklyn Neighborhood. Its 1945 and we are on Manhattan ave and Nassayu Avenue. 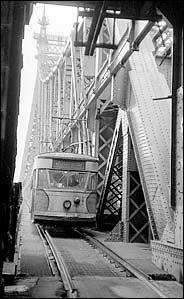 That is a Graham avenue car coming at us and it has come over the double bascule bridge carrying Manhattan avenue to Vernon Boulevard and Jackson Avenue in Long Island City. 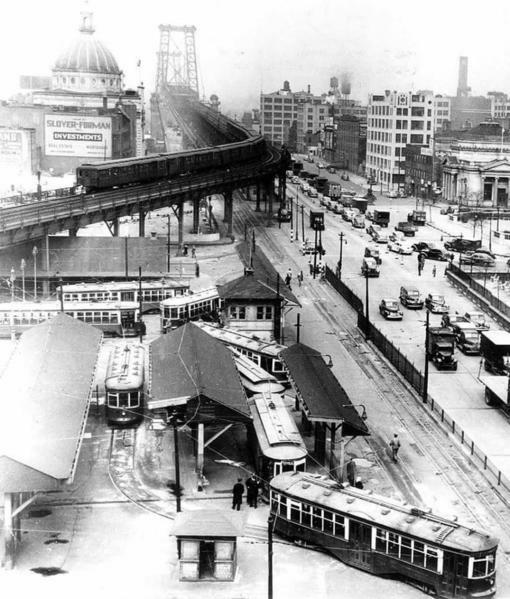 When the car passes us, it will wind its way down to Broadway and then head west at Flushing Avenue to Downtown Brooklyn at Sand Street and then ascend the Brooklyn Bridge crossing to Park Row In Manhattan. 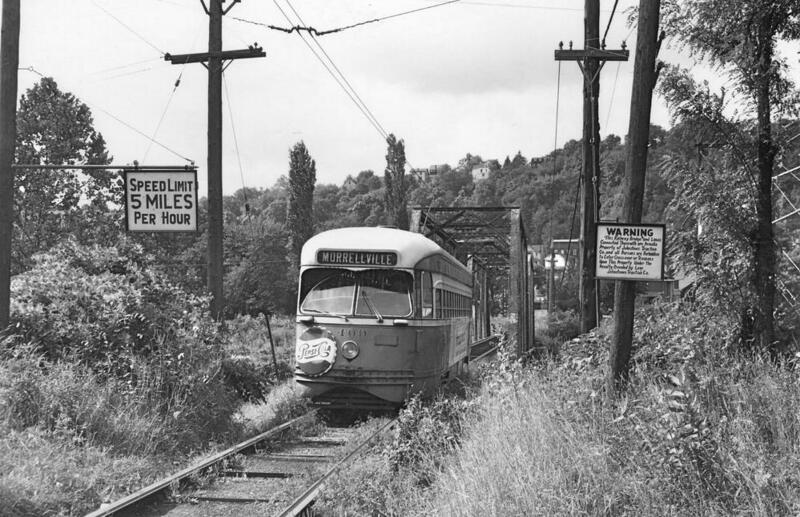 This route was one of a handful that connected three boroughs in the city. I have dozens of trolley photos from my layout (MTH, Western Hobbycraft, Minitoy) recent and a bunch taken in the 1950s. 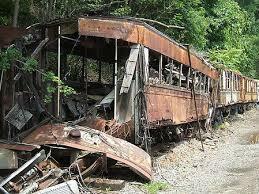 Most of the old trolley cars were burnt and the metal was saved for scrap. The BRT dropped many old trolley bodies into a sand pit at 108th St. 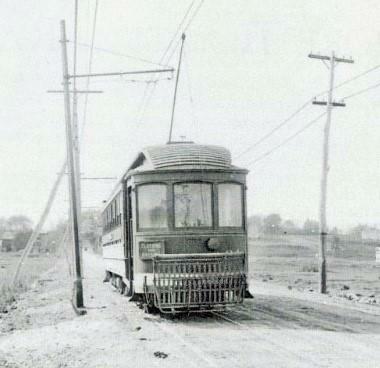 In Canarsie Brooklyn on a short spur off the Canarsie line. 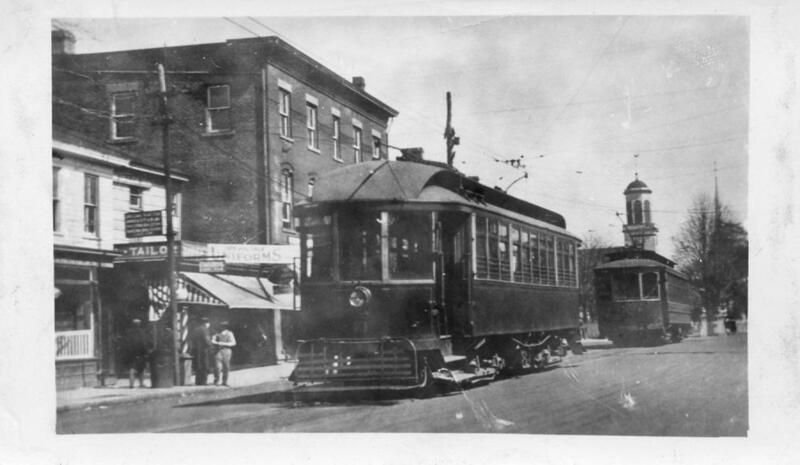 TARS dropped trolley bodies into a pit at the Garden Ave shops in Yonkers. Other cars were sold to scrap dealers and other transit companies or burnt in many locations in the Bronx and Brooklyn along with subway and elevated cars. Many el cars were burnt in 239th St. Yard, East 175th St. 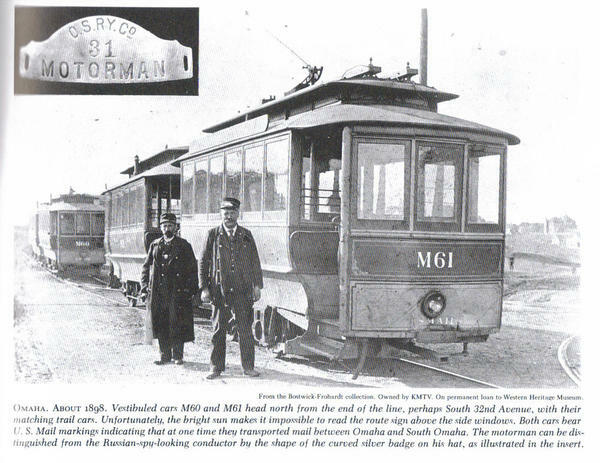 Along the NYW&B right of way and the Bronx River, Classon Point, Coney Island yard and probably more. 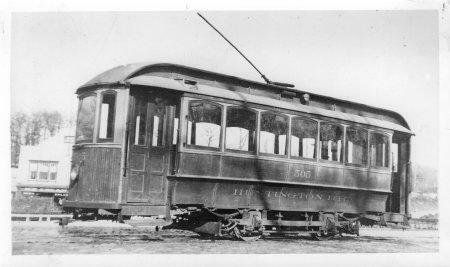 Is it time for Lionel to make a legacy trolley? Riverfront Line along the Mississippi in New Orleans. The clerestory conceals air conditioning components. 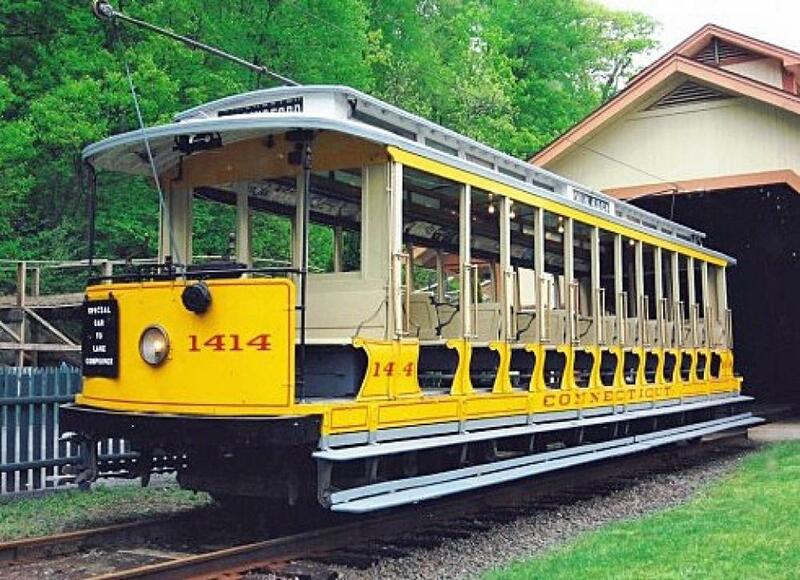 Below is the restored PCC trolley in the Heinz museum in Pittsburgh. 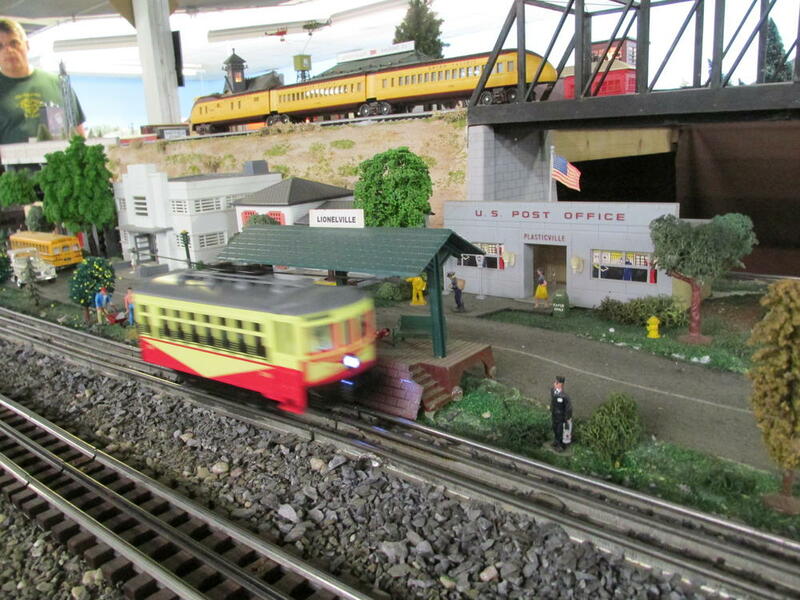 And here is a picture of a similar Corgi Pittsburgh PCC with an S gauge chassis running on my Christmas layout. 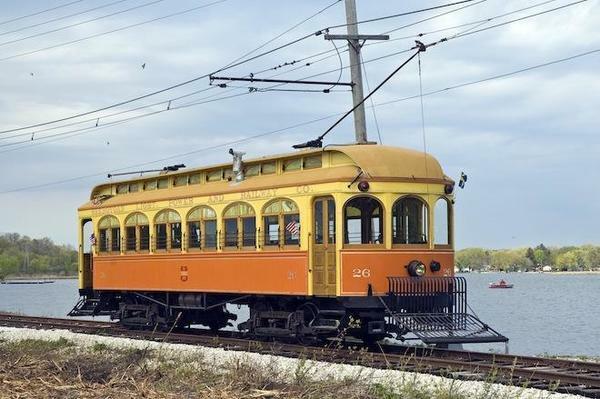 Here are 2 trolley's in the Exporail in Montreal Can. 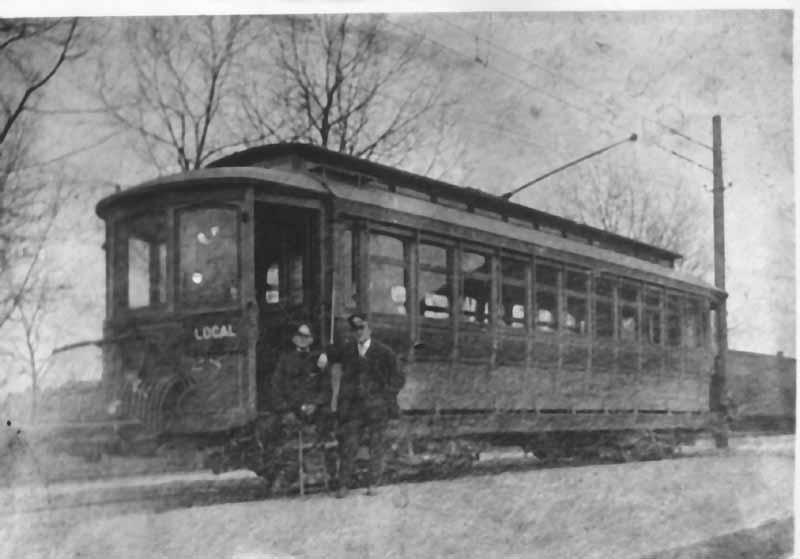 We got to ride in the first one. It is a nice place to visit if you are ever in Montreal. 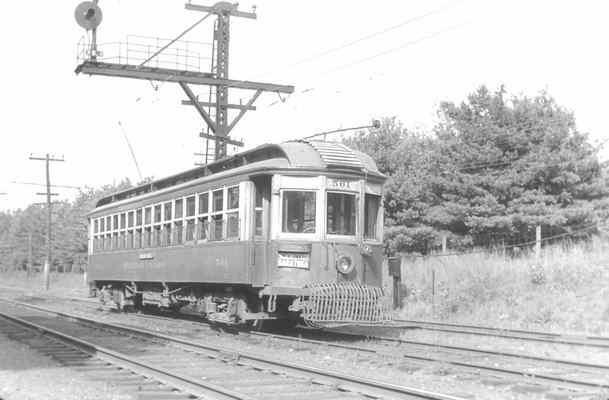 More New York & North Shore Traction cars on Long Island. This is a followup to Gene's post regarding the trolley system in Holyoke, Massachusetts. 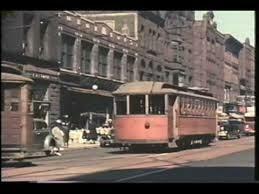 Nice color movie of the Holyoke trolley system. How about some vintage film of snow (ice) clearing operations in Ottawa?
" G.I. 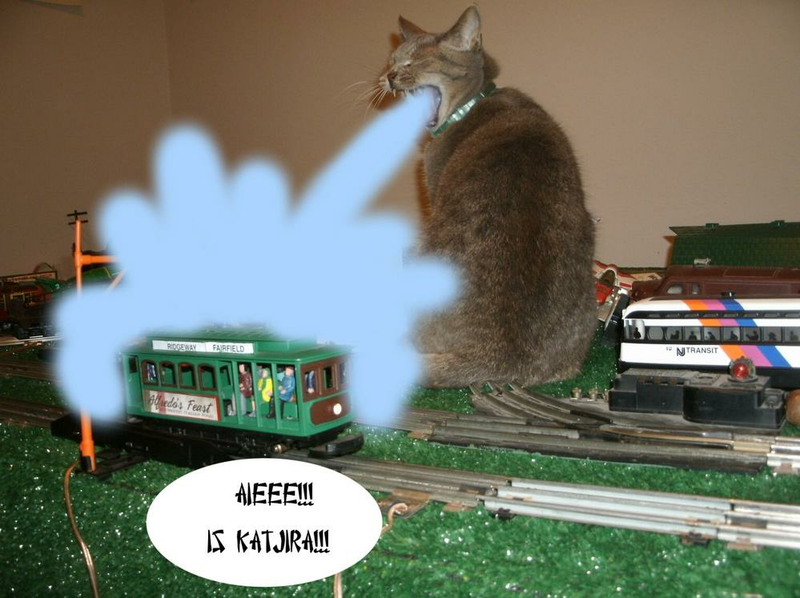 Joes with furry chins and Bionic women and 6 million dollar men action figures are cool too"
Fortescue J. Gi-raffe says, "Did somebody say TROLLEYS?" Nice collection. What make is the 3rd from the left? I don't believe I've ever seen that before. 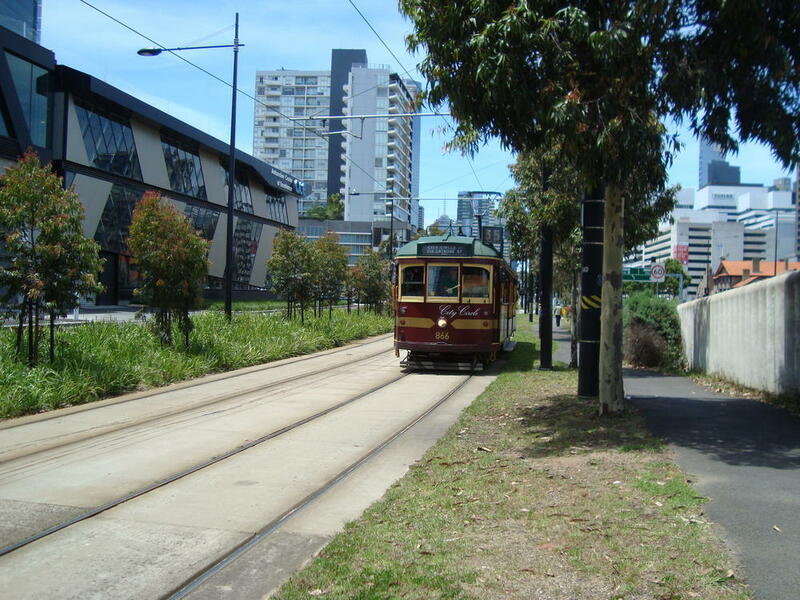 Hey, Roo...I like that display of the partly buried trolley. How about some more information. Such as, where is it, the circumstances that led to it's display, etc. 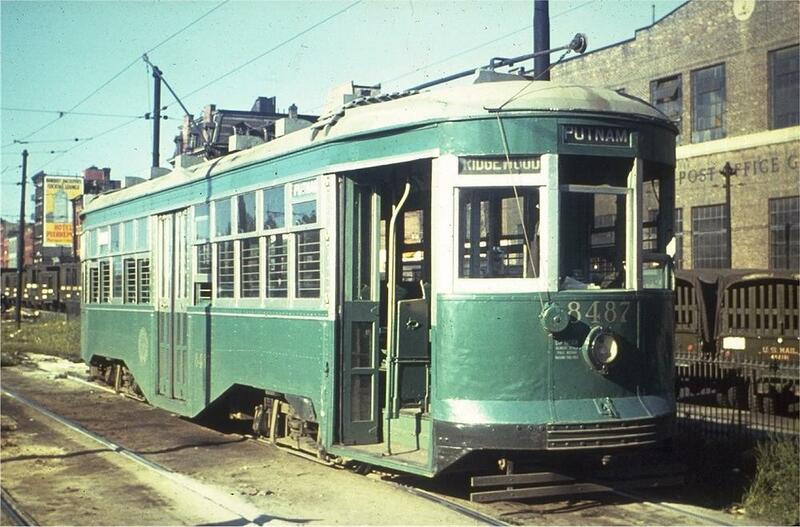 Most streetcars worked long and hard...and did their job well. It's good to see them memorialized. 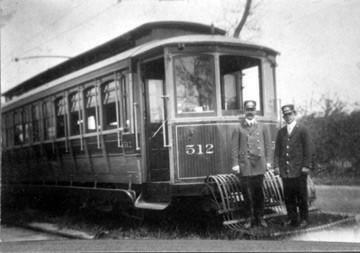 The trolley was pushed into the sand pit at 108th St. In Canarsie Brooklyn and came out the other end of the planet. It took a left toin at Albakoiky! 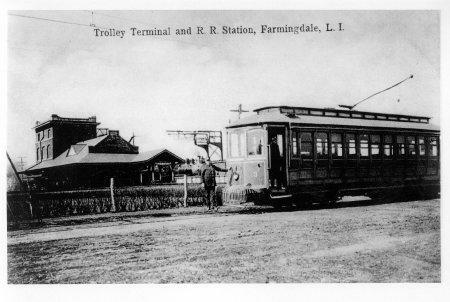 Any Staten Island trolley photos? 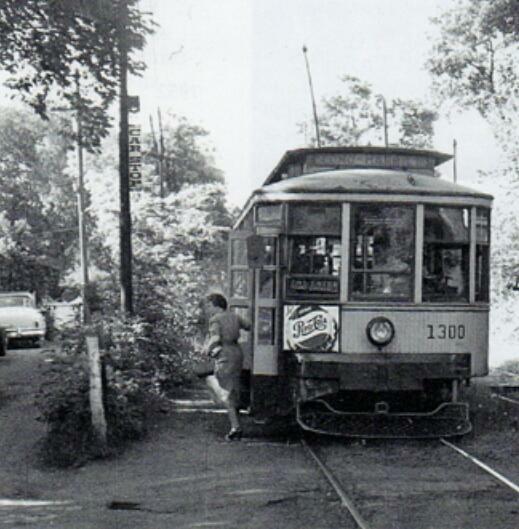 I know they went to Prohibition Park (now Westerleigh Park). This is link to the old Omaha Nebraska Trolley, the noob is having trouble uploading pictures. I will review the instructions again. 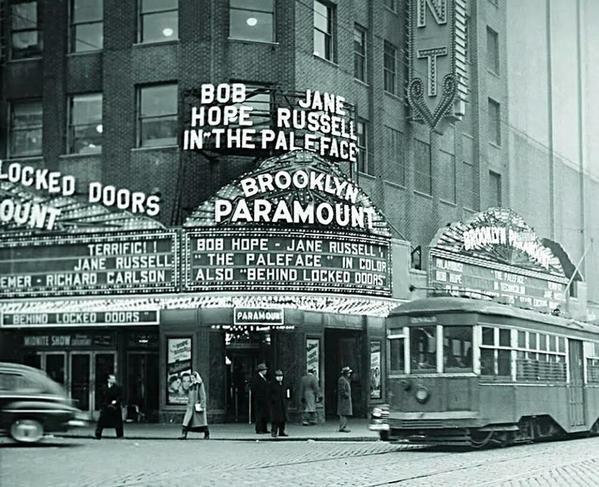 Its 1948 and a New Bob Hope Jane Russell movie is playing at the Brooklyn Paramount. You could ride the DeKalb ave car right up to the box office window. Really like the Cony Island one. These were TCA special run trolleys done in support of the 2015 National Convention. There were 500 made of both schemes and unfortunately just sold out within the last year. There is one on eBay now at a bit above original sales prices (not mine). 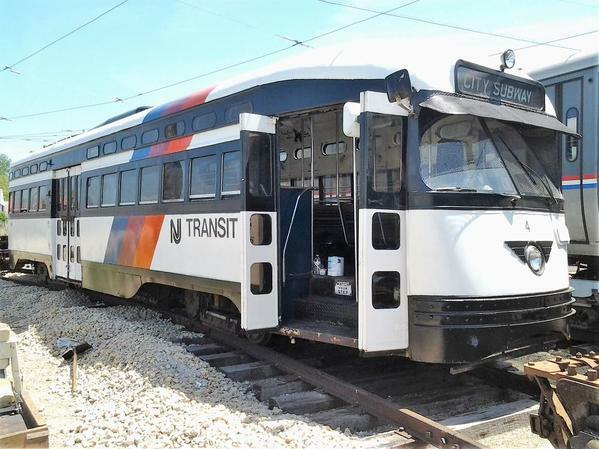 While not accurate to the prototype model, the paint scheme is fairly accurate. 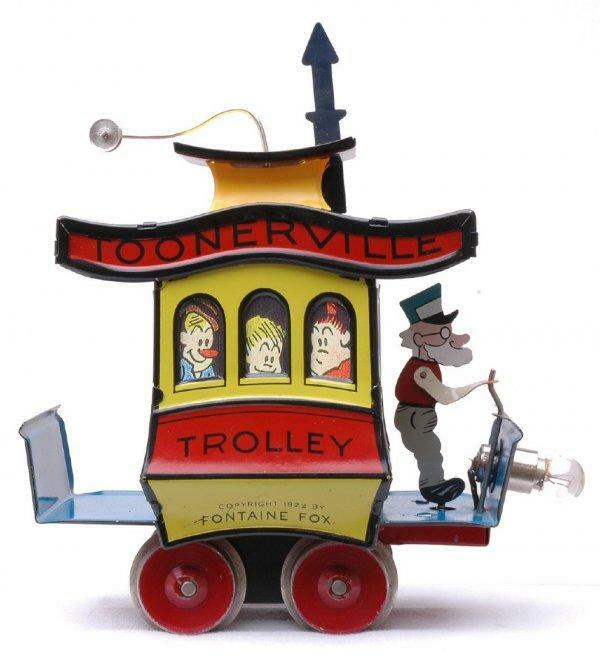 They are just the Lionel bump and go trolleys. 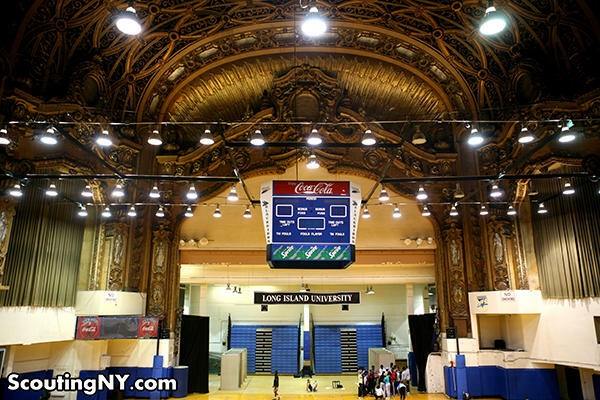 It's now a university gym, but a lot of the old theatre was preserved! Pittsburgh Railways 4300-series double-end “Jones low-floor” car. 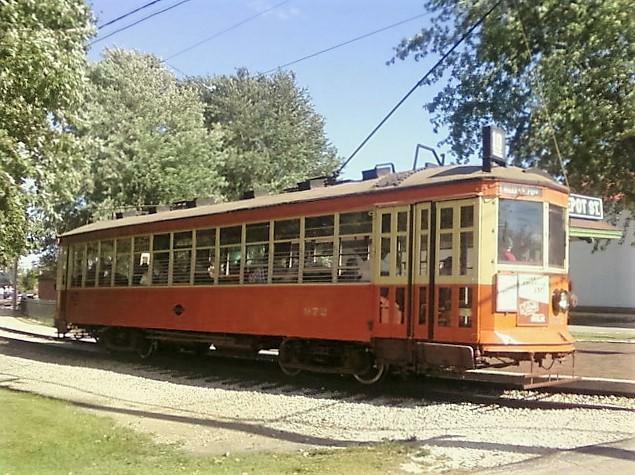 This is the same type of car that I am operating in my avatar photo taken at the Pennsylvania Trolley Museum in 2014. 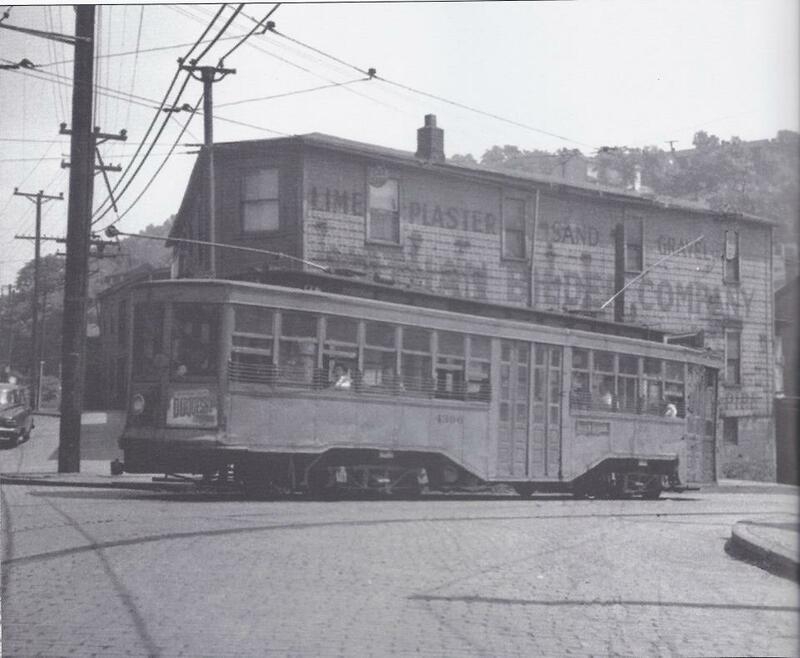 Can anyone identify the location of this photo? 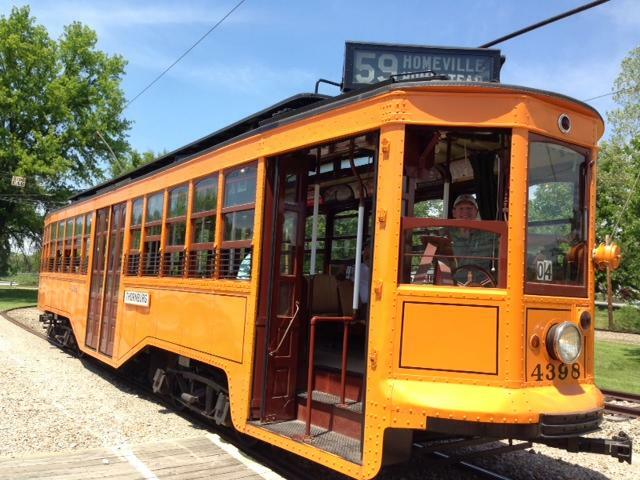 Hint: it's running on the 59 Homeville route. Thank you for that wonderful photo of the Paramount interior. 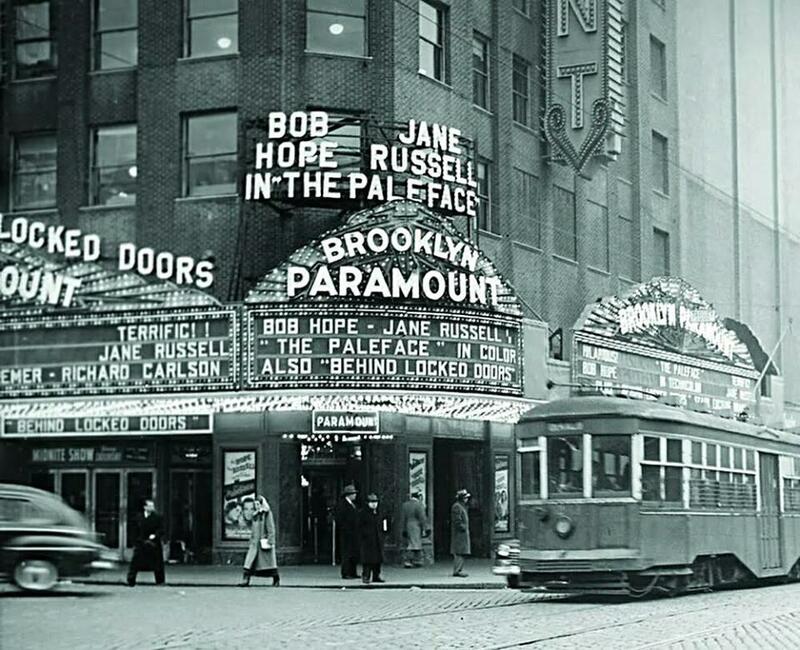 The Paramount was as many other movie palaces of the ages , equipped with Wurlitzer theatre pipe organ. I believe that this pipe organ is also preserved within the Gym Transformation. It is thought to be in working order and supposedly played from time to time. These instruments had a magical sound. 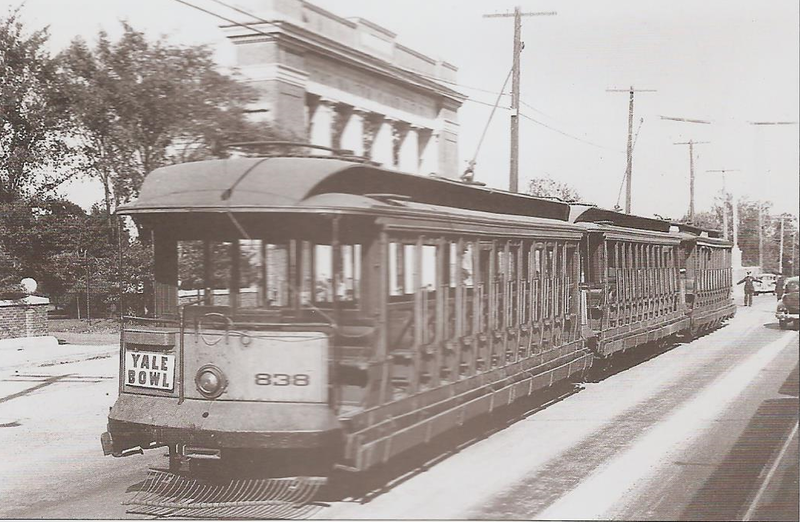 Car 369 in Dallas TX. 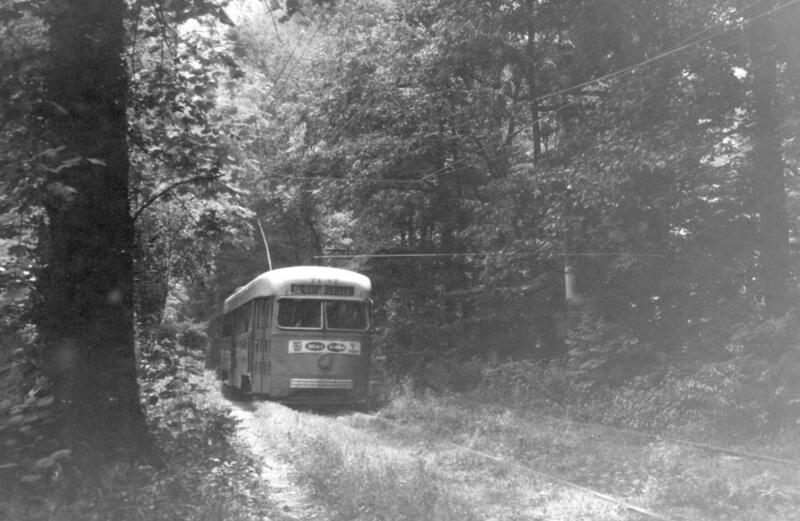 The Hagerstown and Frederick trolley #150 in Myersville. 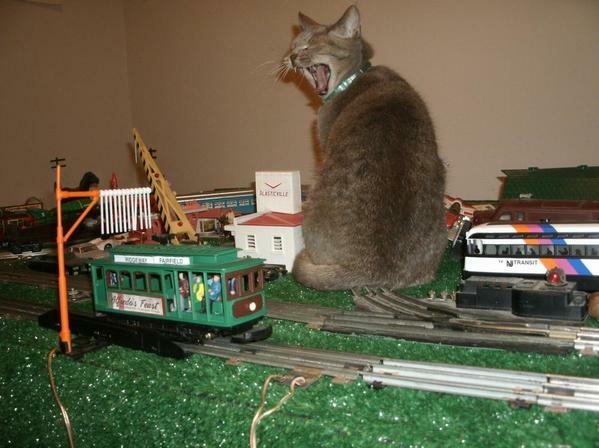 Finally ... retired ... time to play with trains. Is this the western railway museum in Rio Vista Junction? I want to say that's It is coming off of Ravine St onto 8th Avenue. Now I want a slice of De Sallas pizza! You got it – the Munhall Junction! And DeSalla’s Pizza at the Junction was the best around. It was the very first pizza I ever tasted. But they probably weren’t there yet when this picture was taken. 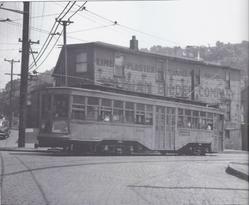 The streetcars are long gone but DeSalla’s is still in business. Can’t wait to eat a few slices on our trip “home” for the TCA Convention in June. 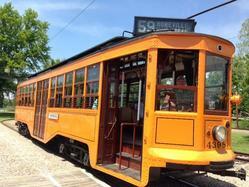 And attached is a photo of the restored model at the Pennsylvania Trolley Museum in “Little Washington”. Respectfully disagree. 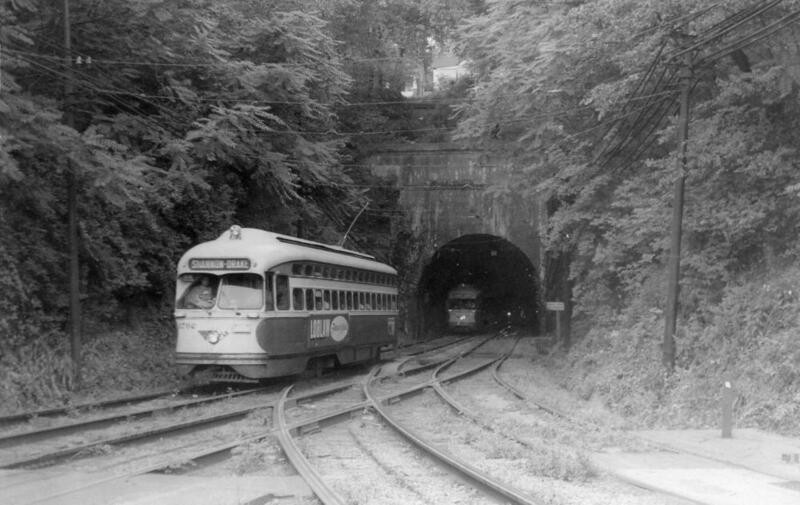 If the system was still in operation in the 80s, I'd tell you to transfer to the 68 and get off at Latina's across from Kennywood, or take the 65 up to Lincoln Place for some Rocko's. But, then again, it's all good. So two more from Brooklyn and Queens. This one tales us to Bridge Plaza at the foot of the Williamsburg Bridge. It looks like it could be evening rush hour judging by the 4 lanes of traffic open eastbound. 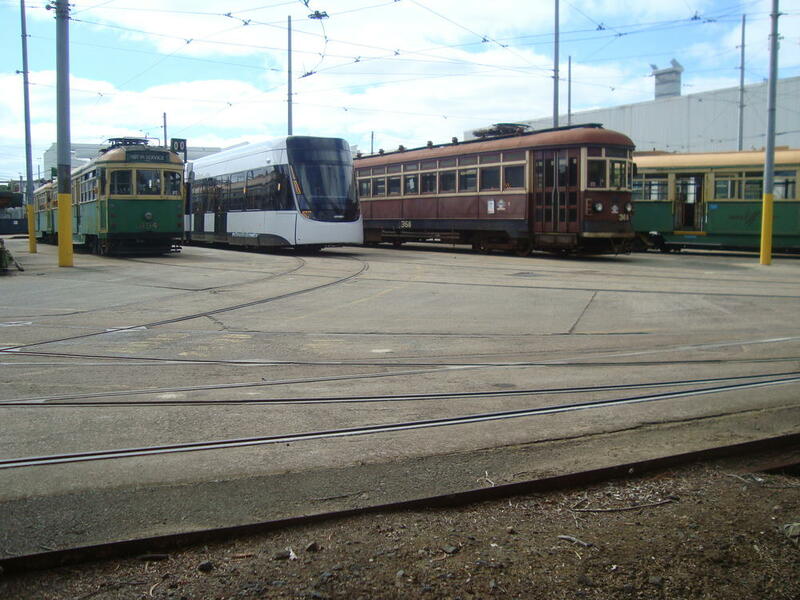 and the number of trolleys in the plaza. 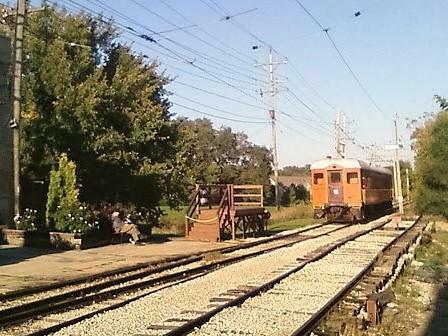 A BMT standard train is on the approach. 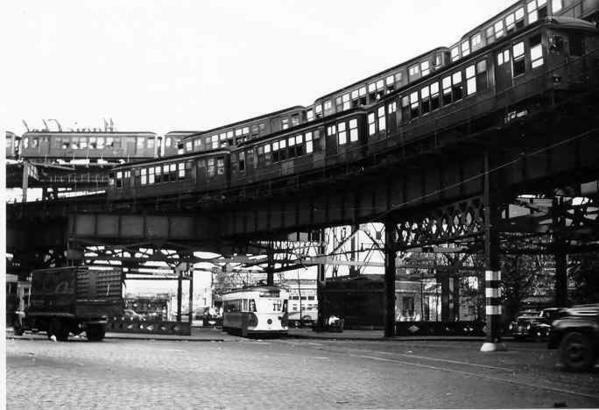 Ok so lets go to Queens at Queensboro Plaza. WE see a Steinway car on the way to the bridge to Manhattan. This was the last trolley line in Ndew York City, ending service in 1957. This photo was at least 10 years earlier. A lt of Rapid Transit action on the BMT side of the Elevated station. This complex is reduced in size today withoperations much simplified . This is a good looking car, but unfortunately it is a terrible runner. It has a sliding pickup shoe that needs to be converted to a pair of rollers. 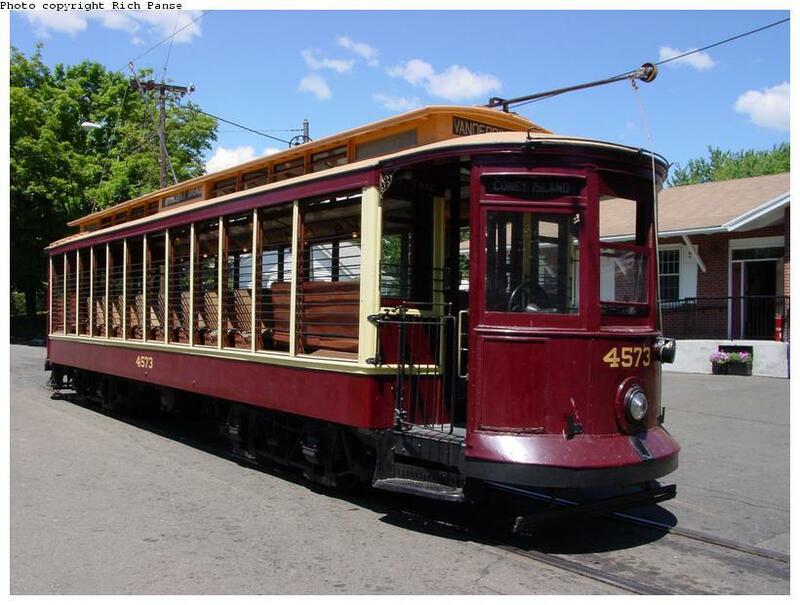 I do not anything about this interurban car, but the color scheme is fantastic. 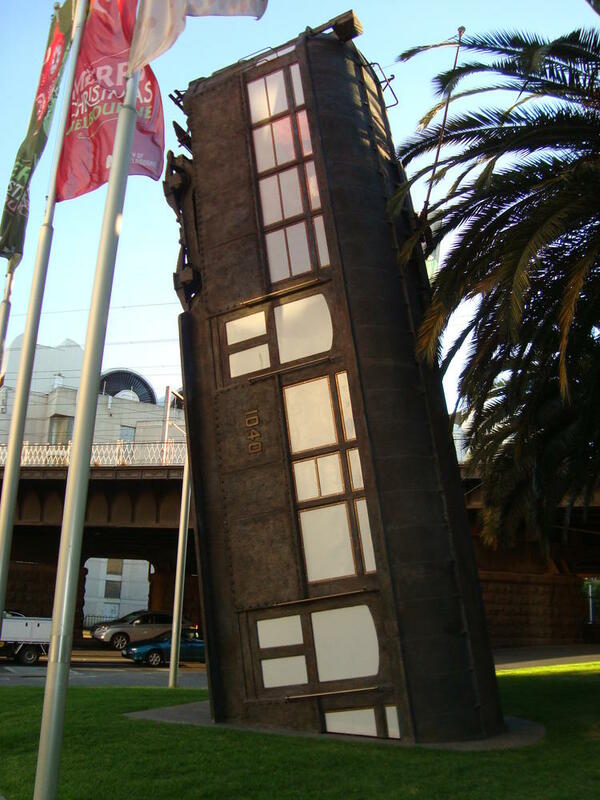 Who built this beauty, and where is it now? Agreed. I'll research the subject a bit and see what rollers might work well. Interurban trolley No. 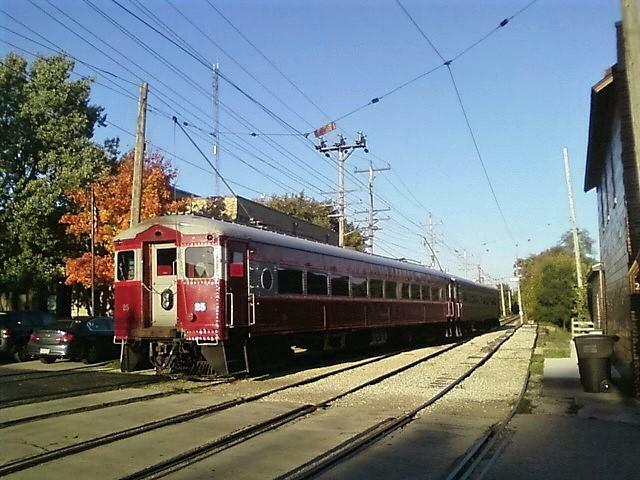 26, originally manufactured for the Sheboygan Light Power & Railway in 1908 and meticulously restored by East Troy Electric Railroad volunteers in 2005, will ride the rails this summer. 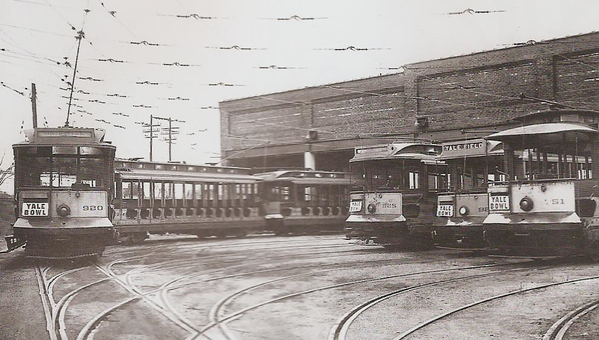 The photo of Queens plaza depicts BMT Q cars on the structure. 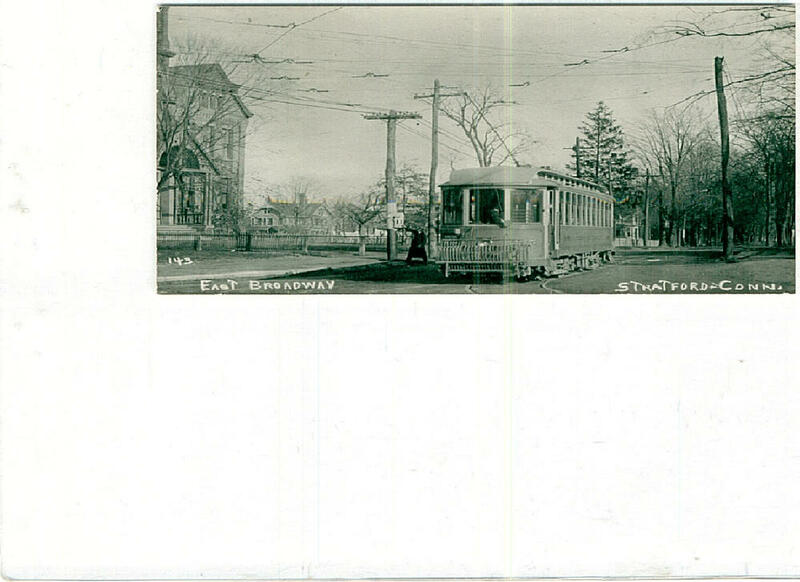 They were running in joint operation with the IRT who ran Steinways and Worlds Fair cars which were compatable with the Steinways. 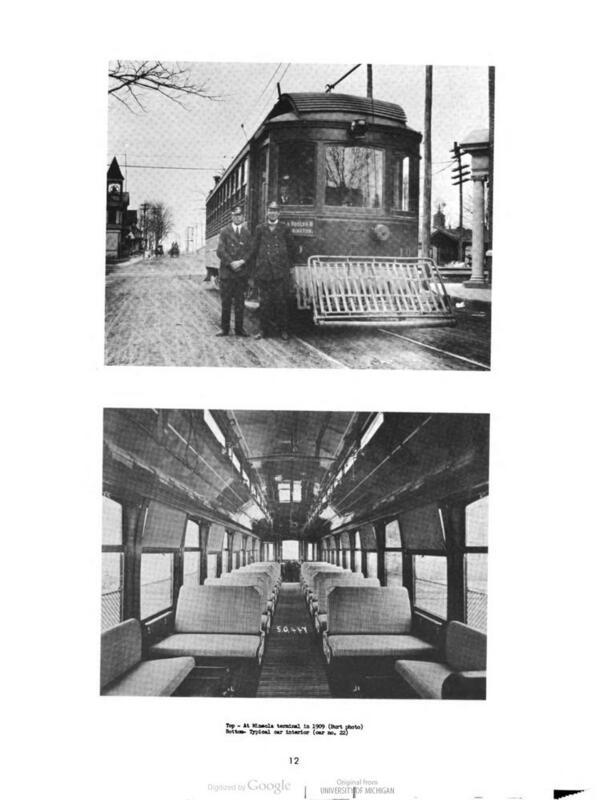 The Q cars were rebuilt for the Worlds fair as well. They were originally open gate cars. 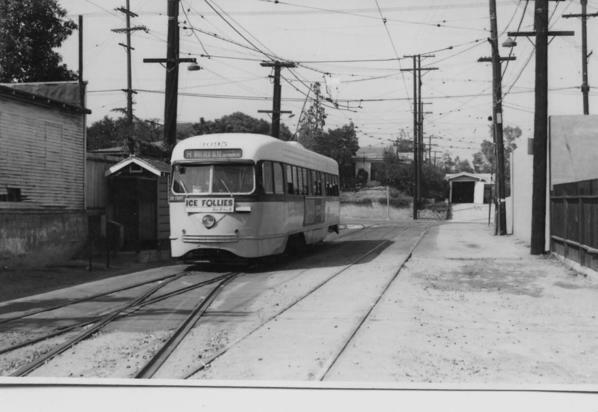 Some of them were subsequently transfered to the IRT 3rd Ave el. Then transferred back to the BMT and ended their career on the Myrtle Ave el. 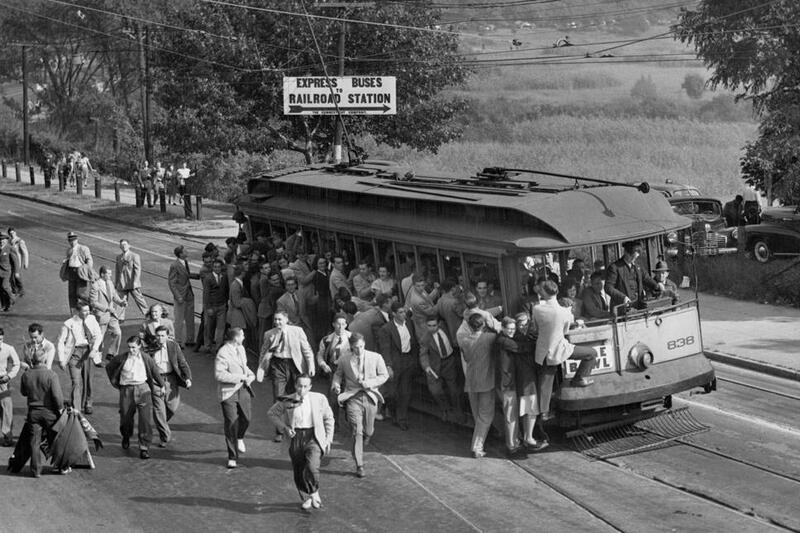 When they ran to the Worlds fair they were the fastest cars on the system. 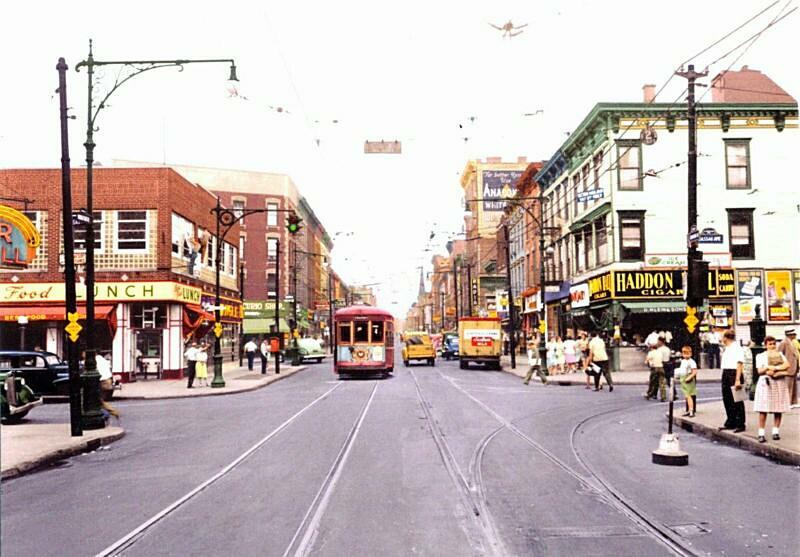 When they went to Mahattan the trucks and motors were changed to maximum traction and they became the slowest cars n the system. Needless to say the had quite a history. It did not end then. 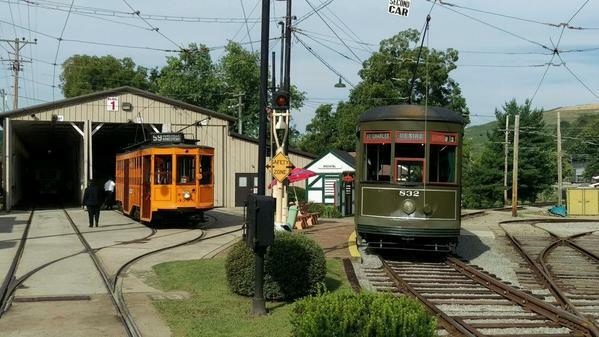 One unit, 3 cars were rebuilt back in to gate cars and now reside in the Transit Museum along with a single closed car. 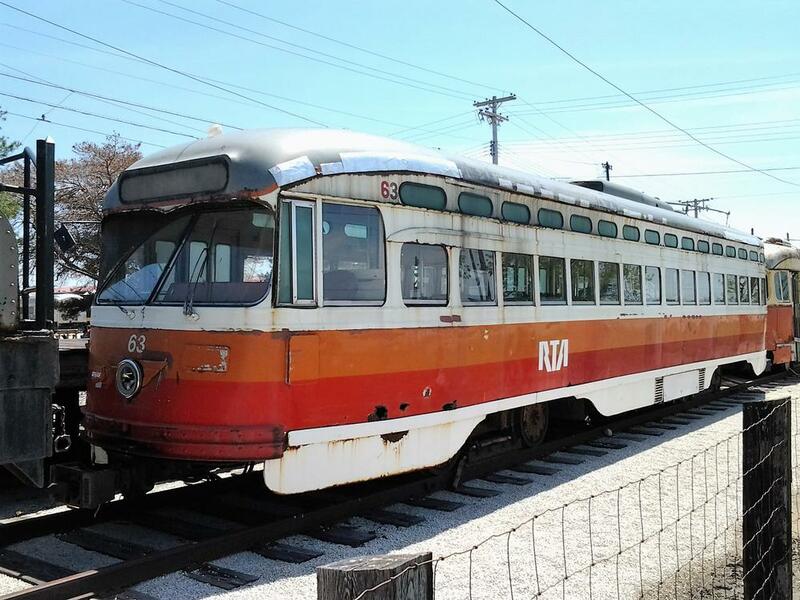 Another closed single car resides in the Trolley Museum in Kingston New York. I was born and raised in Melbourne and lived there for 24 years until I moved to the Wild west. 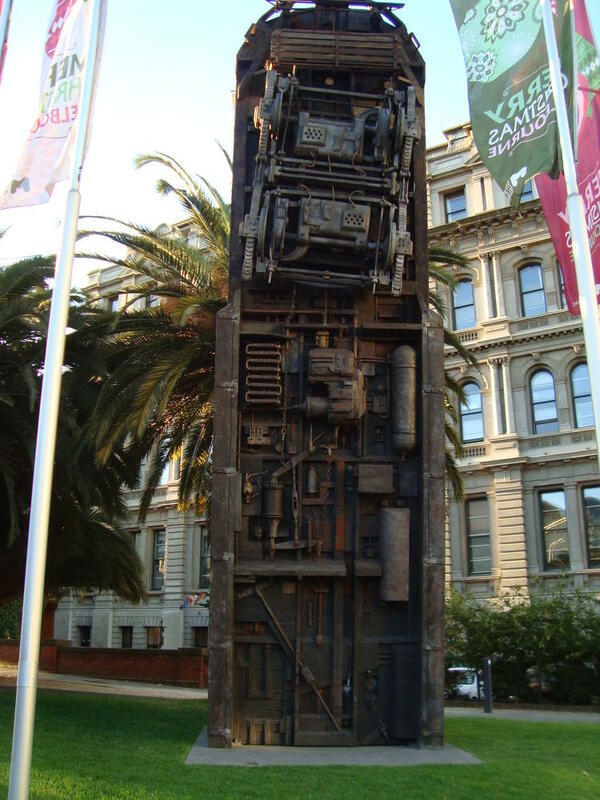 Trams have always been a part of Melbourne since the early 1900's the tram stuck into the dirt is just a arty memorial for trams, Melbourne people like those type of things I tried to find a photo of the sign which I thought I snapped but maybe I didn't. 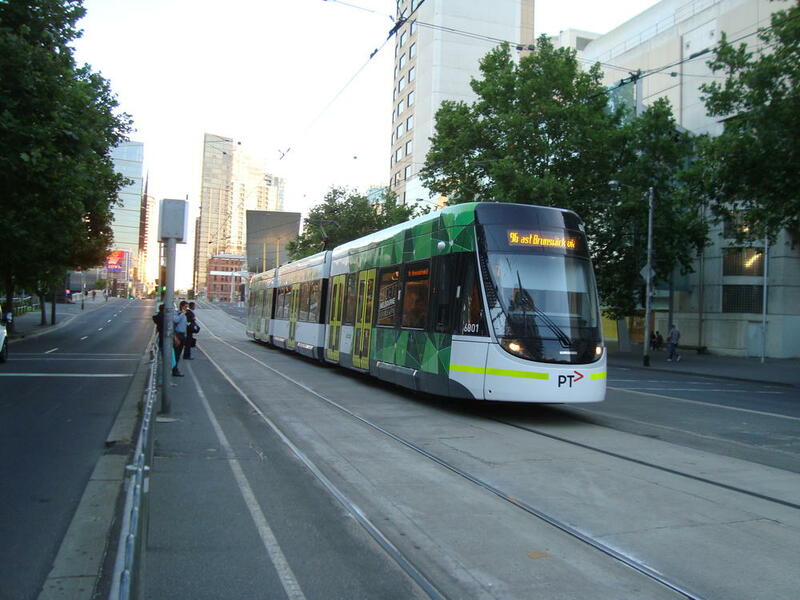 Trams in Melbourne today are like mini trains they are getting bigger and bigger here is one of their latest. Roo. ROO. Very cool story, you share well. I appreciate your posts. Salute! It's a great looking Tram...Errr, trolley. I was born in a suburb where everyone in it were ordinary workers most never had cars and never had any money, so trams and trains is what we travelled on for years. I loved every minute of it so public transport to me was an extension of my life. 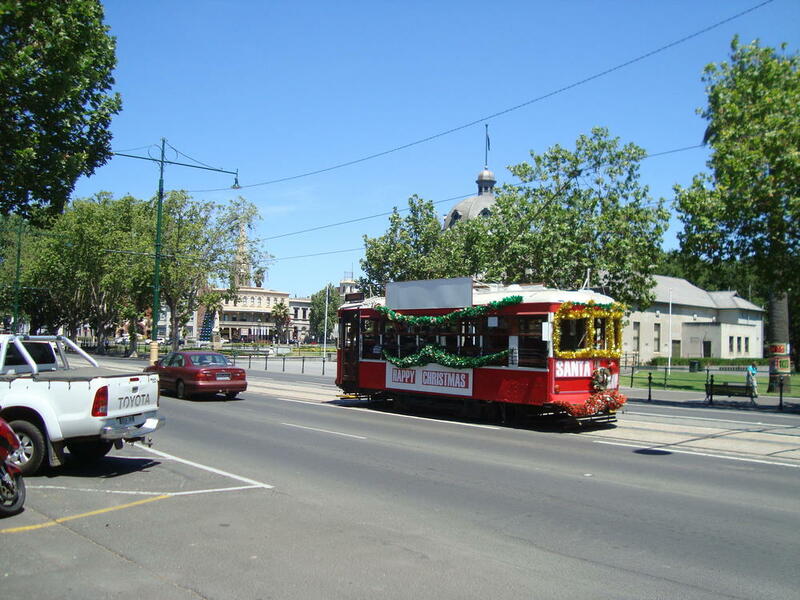 This tram is in Bendigo, Victoria a large town north west of Melbourne I think it might be just a tourist tram nowadays we rode on it. 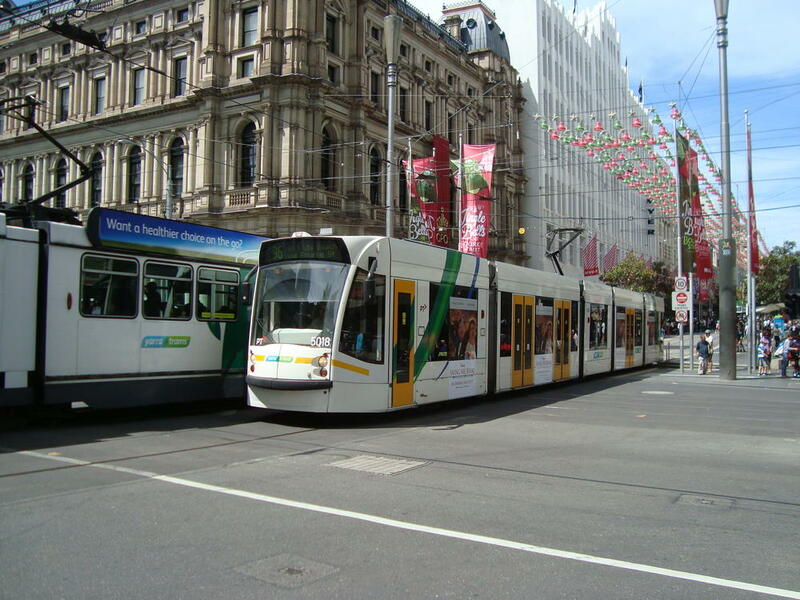 The double crossover is Elizabeth Street, Melbourne it's spring loaded but can be switched by the driver by a lever they carry on the tram. 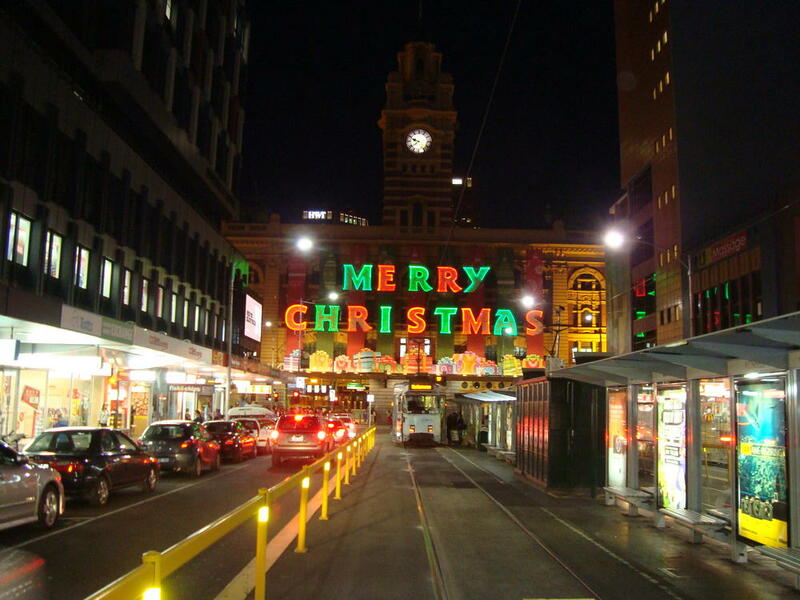 Christmas is a big thing in Australia we still follow tradition for how long I don't know. 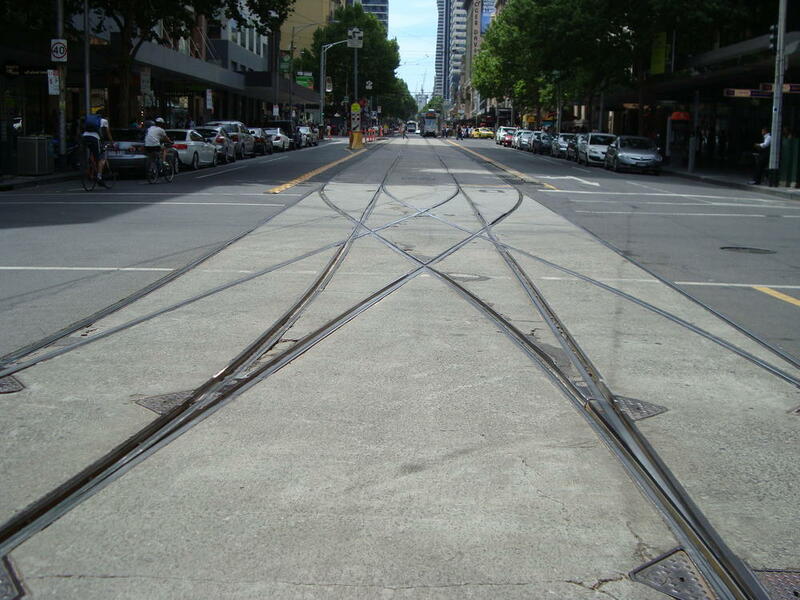 I like all the photos here even though I have never modelled traction......or trams! Roo. From the 1992 book “Touring Pittsburgh by Trolley”, this photo shows Pittsburgh Railways PCC streetcar #1657 inbound on Route 48 Arlington on a short private right-of-way between two residential homes in 1961. 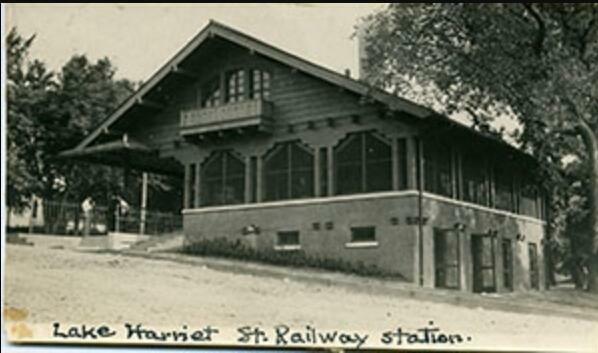 As the author, Harold A. Smith, states in the caption to this photo, “it was perhaps the ultimate in backyard railroading”. 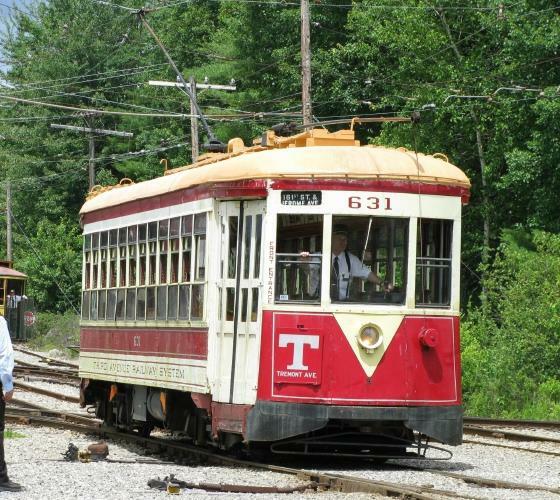 No, that photo was taken at the Pennsylvania Trolley Museum in Washington, PA. 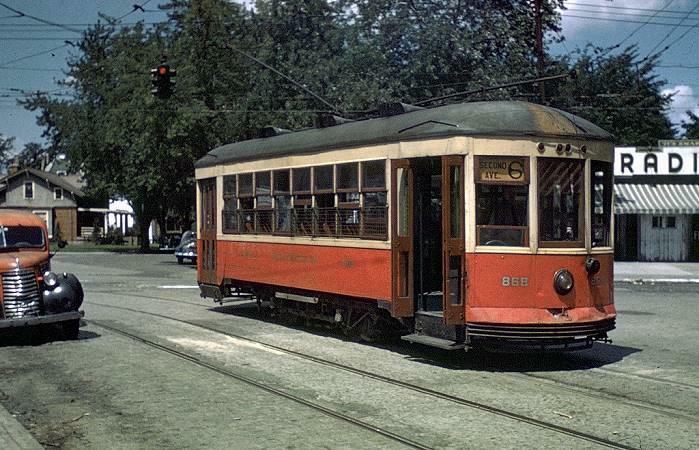 Thanks for identifying this great looking car as Interurban No. 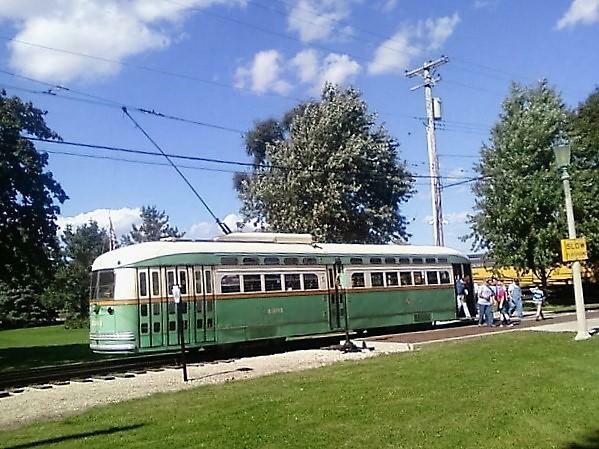 26, originally manufactured for the Sheboygan Light Power & Railway in 1908 and meticulously restored by East Troy Electric Railroad volunteers in 2005. New York & North Shore Traction Company Car southbound to Mineola. This is likely a Kuhlman built car. The Roslyn Clock Tower was a trolley stop and the tower still stands today. This may be the same car northbound to Port Washington. 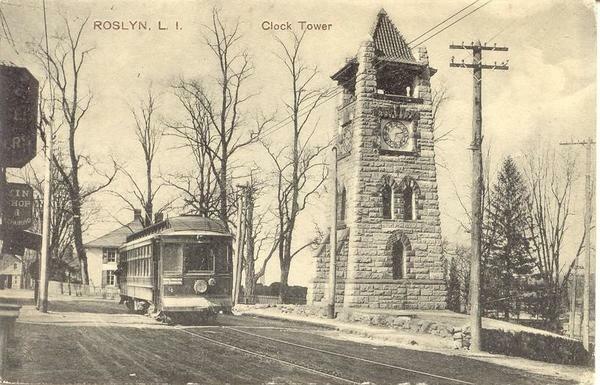 It is about to climb a hill and cross Northern Boulevard (Rt 25A). Have any Kuhlman cars of the early 1900s been saved? 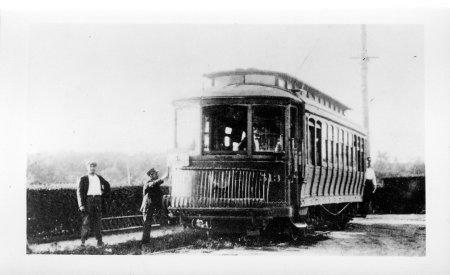 MWB raised my curiosity about the Conestoga Traction Company. 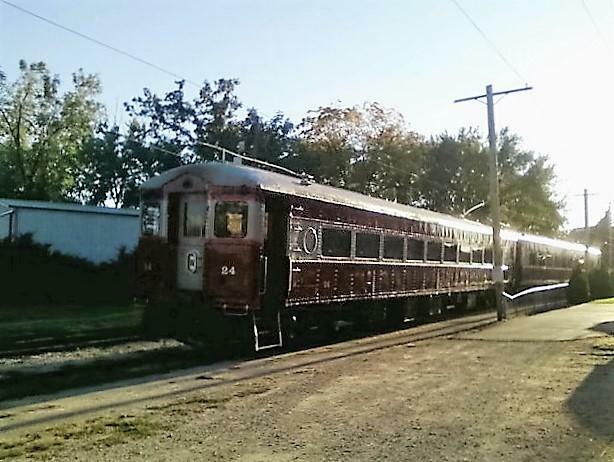 Here's a link to some more info about the Conestoga Traction Company including some color photos, and surviving Birney #236. 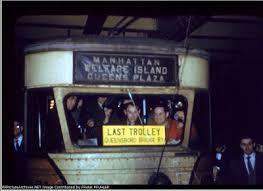 The last trolley car to run in New York City on the Queensborough Bridge. 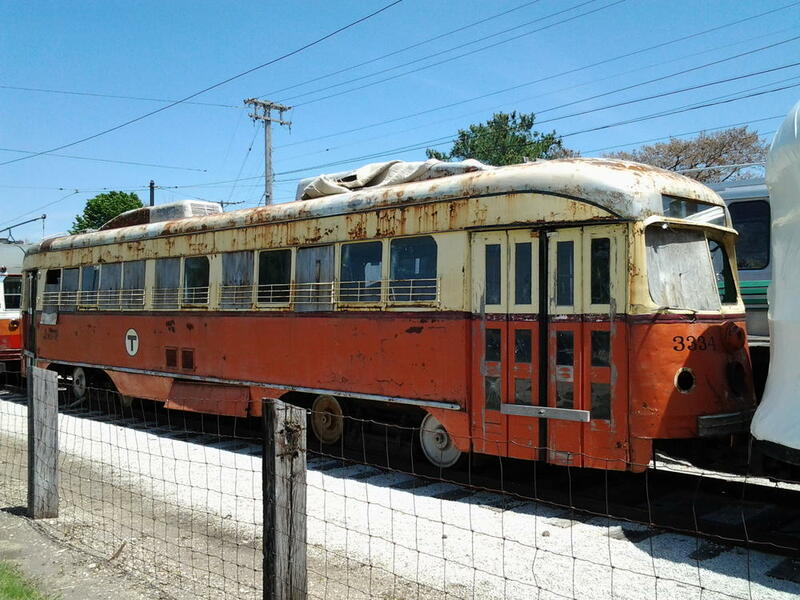 Unfortunately, this car was not preserved. VERY SAD! I remember those cars very well on trips into Manhattan in my younger years. Also my all-time favorite NYC bridge! RE: Paramount Theater in Brooklyn - my mother once worked there as an usher in her youth with a then aspiring singer named Vic Damone. They may have more examples but the search is a little clunky, to say the least, and I'm in a rush. Great pictures everyone. 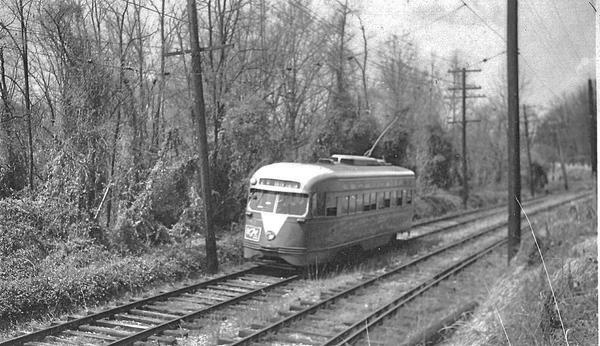 The Huntington Railroad on Long Island. This company ran a trolley line from Halesite to Amityville via New York Avenue (AKA Rt 110). 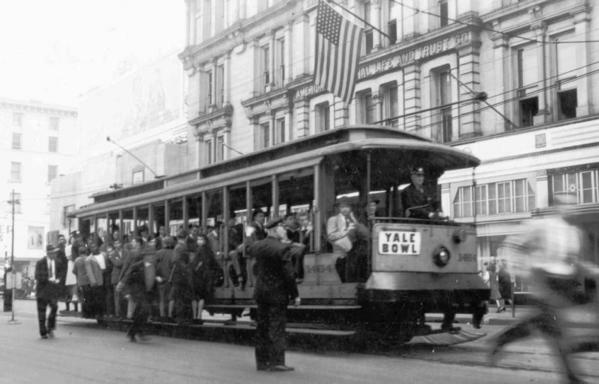 Among my favorite trolley cars are the Connecticut Company's Yale Bowl cars. 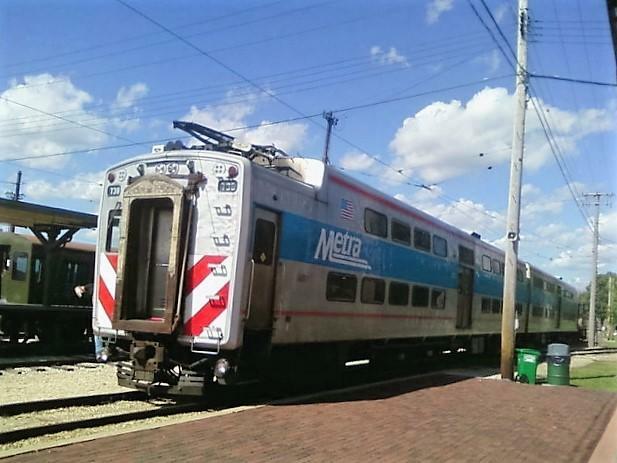 The numbers of passengers that jammed these cars was spectacular and unprecedented. I have often made posts on this forum begging MTH to market a Rail King Osgood Bradley open car. I realize that a can motor and PS 3 electronics would need to protrude above the floor over and between the car's trucks. However, the protruding items can easily be hidden by loads of people just in the pictures of the Yale Bowl cars. 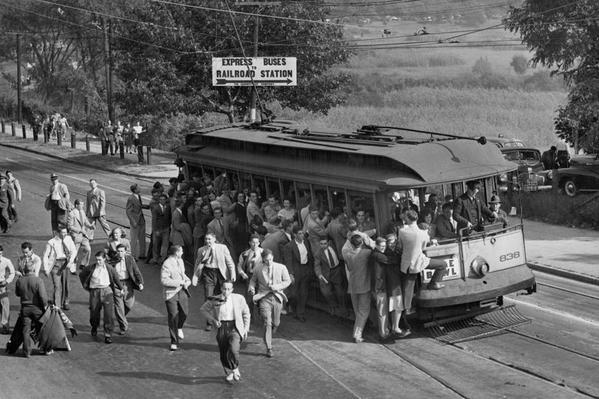 Look at the list of this Yale Bowl car jammed with passengers. I realize that a can motor and PS 3 electronics would need to protrude above the floor over and between the car's trucks. Maybe not. Consider the use of magic carpet drives; possible to put most electronics in the ceiling? 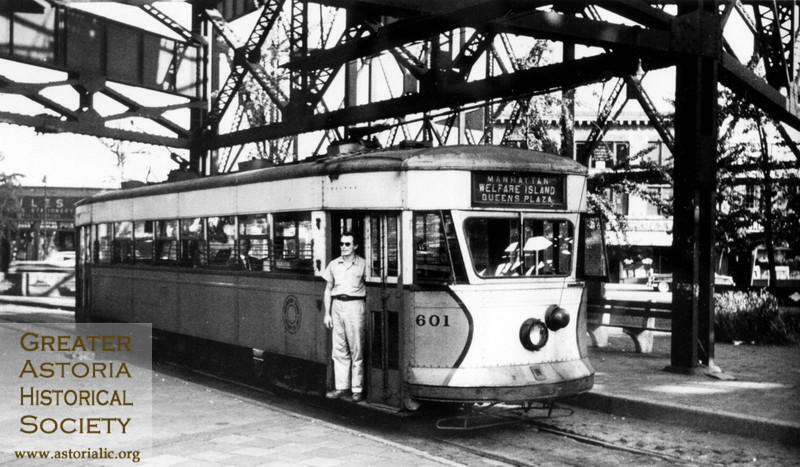 Is there any hope that the Queensborough Bridge Car 601, the last trolley car to run in New York City, can be restored to operating condition? I'd like to have that one in my back yard. The neighbors would love it.